If you liked this show, you should follow The Savvy Shrink. 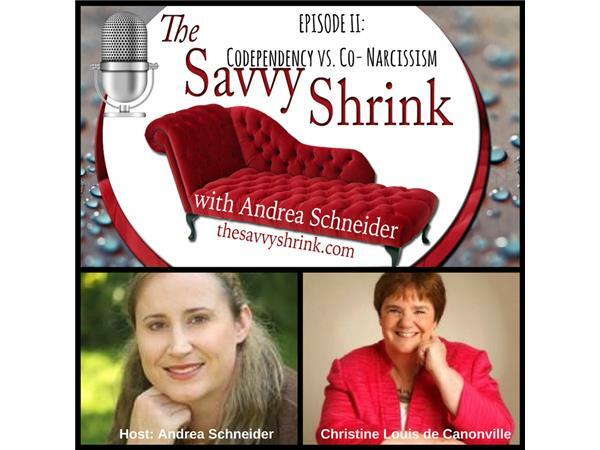 Andrea Schneider, LCSW and Christine Louis de Canonville ask listeners to explore the difference between codependency and co-narcissism. You'll be surprised and the conversation will make you take a deeper look at the meanings of both of these words. Christine Louise de Cannonville, B.A. ; MIACP; MTCI; MPNLP, CMH; CHyp has been a Psychotherapist and Supervisor of mental health professionals for over 20 years. She has recognized a gap in the training of many therapists.Her book THE 3 FACES OF EVIL - Unmasking The Full Spectrum Of Narcissistic Abuse sets out to address the shortfalls in a therapist’s education so that they become better equipt to work with survivors of narcissistic abuse. We encourage everyone listening to take the time to read more about her work here. Christine has created an effective program for working one-to-one with victims suffering from Narcissistic Victim Syndrome, and developed workshops for educating therapists and other health professionals in the whole spectrum of Narcissistic abuse. Much of her knowledge has come from her post-grad studies in Criminology and Forensic Psychology, and it is through these disciplines that she has gained her understanding of the The Dark Triad, (Narcissism, Machiavellianism, and Psychopathy). These Three Faces of Evil are vital information for understanding the full spectrum of narcissistic abuse.